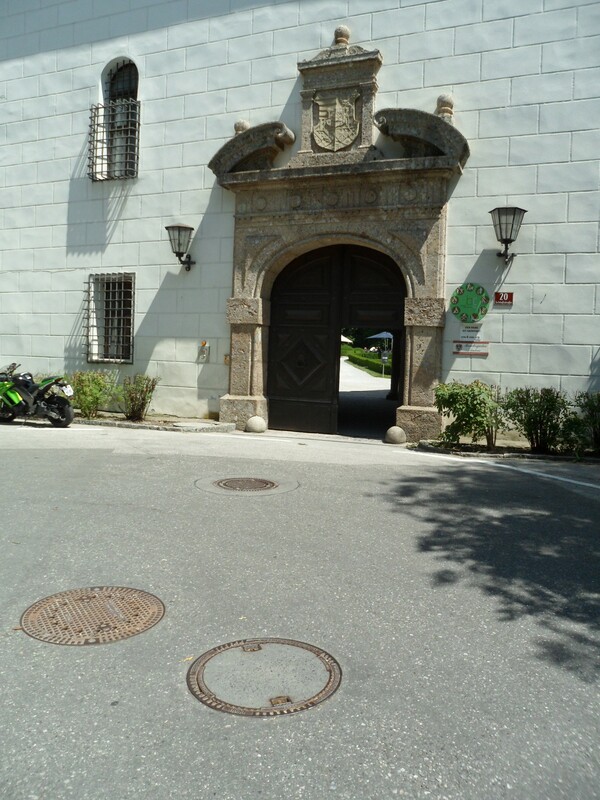 The gate to the lower court, Schloss Ambras. Photo by Sean Manning, July 2013. Today Schloss Ambras is the sort of castle where lizards scamper across the stones in the sun and wedding parties wander across the lawns looking for the perfect place for some photos. After all, it was converted to a living and hunting castle for Philippine Welser in the sixteenth century, with a beautiful sloped park full of trees, a scenic view down onto a gorge and the Inntal, and plenty of space for hunting. But like some other places, it has a few secrets. 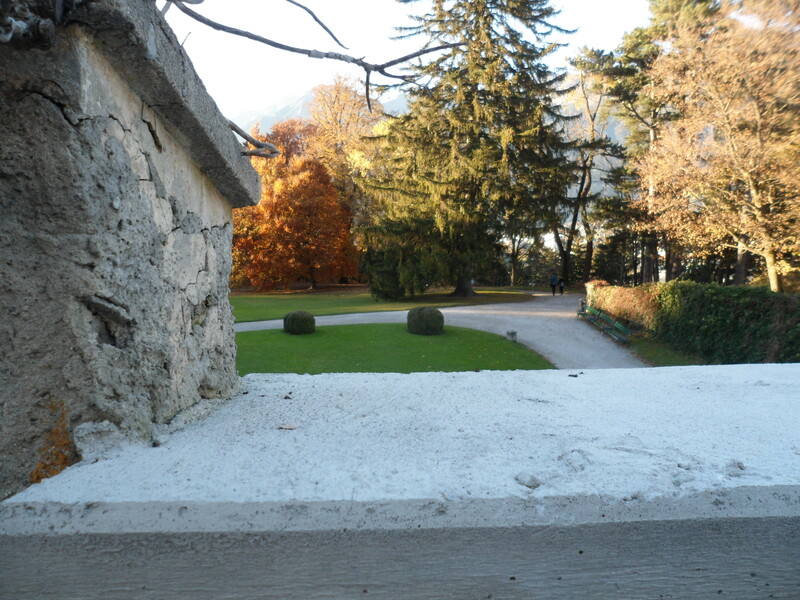 Visitors to the Schloss traditionally approach it from the east, where there is a narrow space between a high bank on the right and the wall of the park to the left. 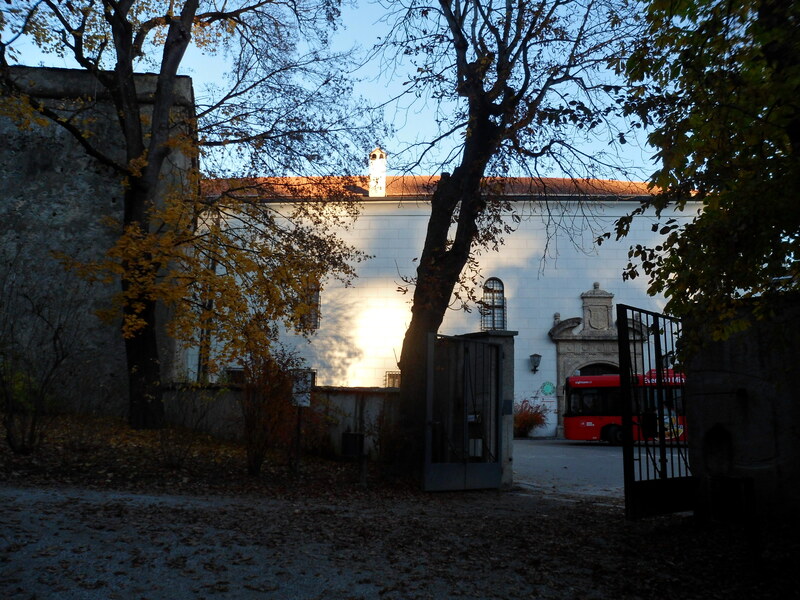 As the ceremonial entrance this has been beautified with a large stone gateway suitable for driving a carriage through. Curiously enough, however, there are very few windows near ground level (I suspect that these are a later addition) and the ones above are very high and small. The double gate is a good four inches thick and well banded with iron, and all the windows are protected with a well-anchored grill of iron bars as thick as my thumb. Since we can’t climb the bank to our right, and the park is so beautiful, lets turn left and proceed clockwise. Left side of the gate to the lower court, Schloss Ambras. Photo by Sean Manning, July 2013. As we look to our left, we see this large unplastered structure. It is solid earth and rubble, and is not plastered or whitewashed. As far as I can tell is is completely solid and does not mask galleries or a building. 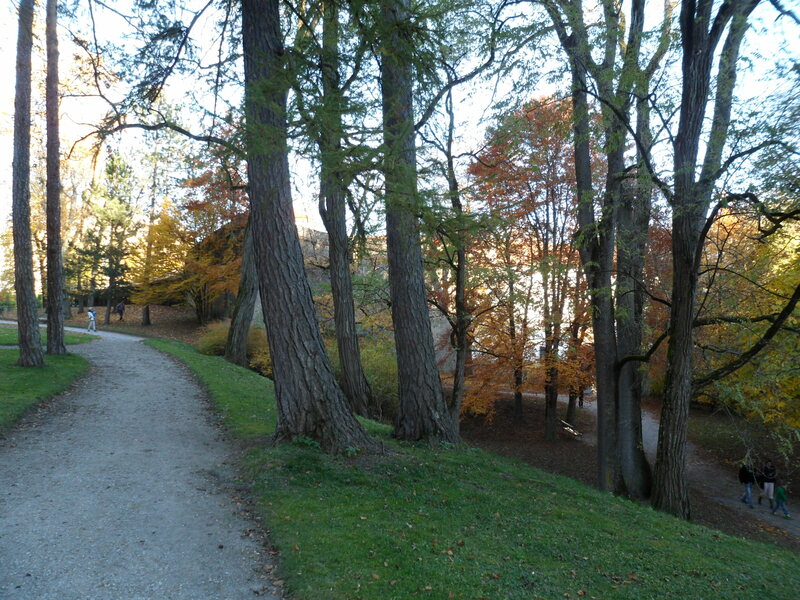 View from park towards the gate to the lower court, Schloss Ambras. Photo by Sean Manning, November 2015. 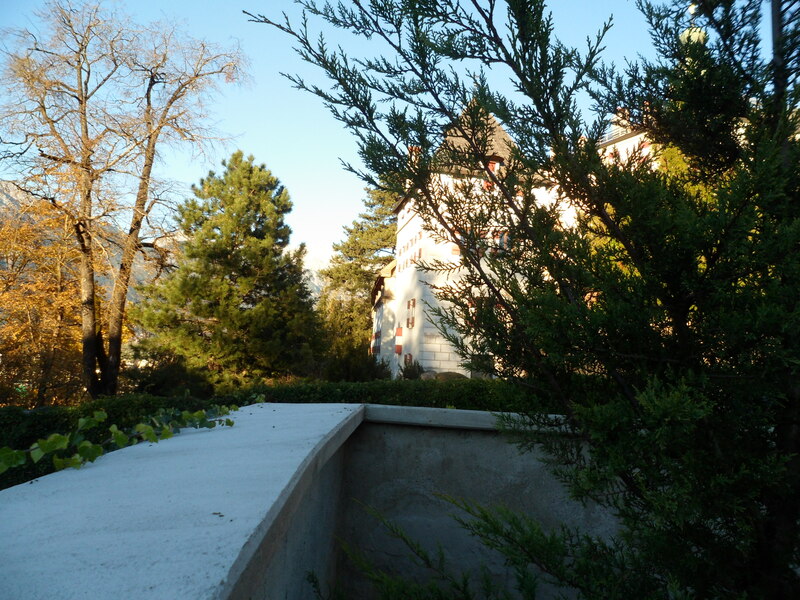 As we walk into the park in the twilight of fall and turn around, we can see the wall of the park as it meets this large earthen structure, and the front gate. View of the bastion from the park, Schloss Ambras. Photo by Sean Manning, November 2015. Continuing into the park over the snaking folds of the ground, this structure still looms over us. 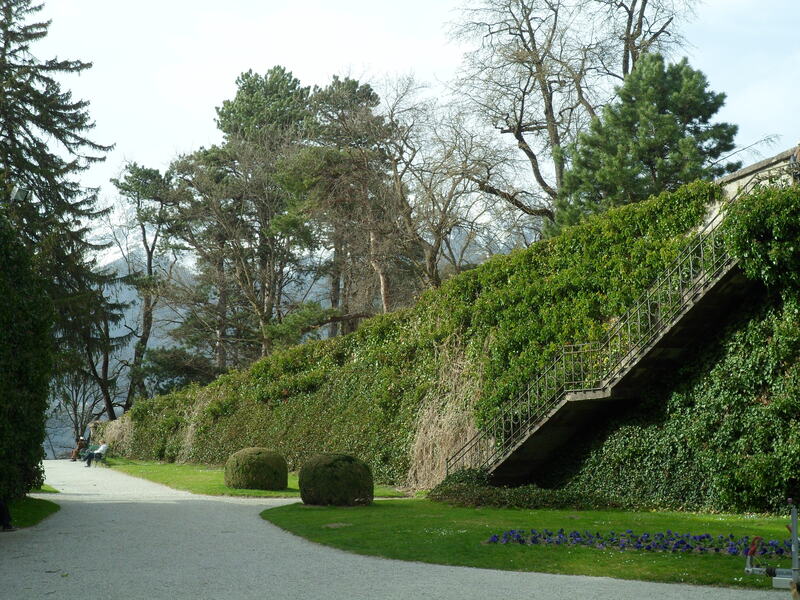 Angles of the bastion of Schloss Ambras, Innsbruck. Photo by Sean Manning, November 2015. 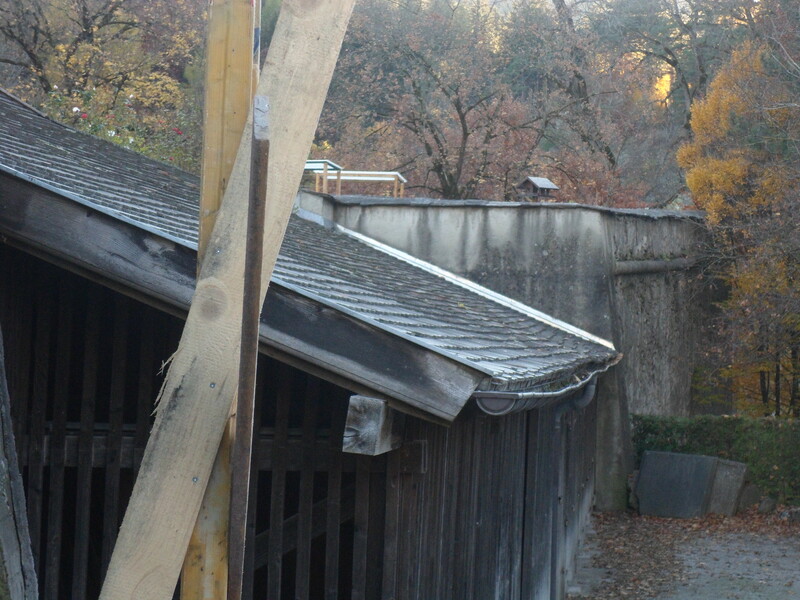 As we climb higher and move towards the south side of the Schloss, this large stone and earth structure is only four or five meters above ground level. Those pointy angles projecting outwards from the corners of the structure help to give its form a pleasing variety. Bastion of Schloss Ambras from the south. Photo by Sean Manning, November 2015. 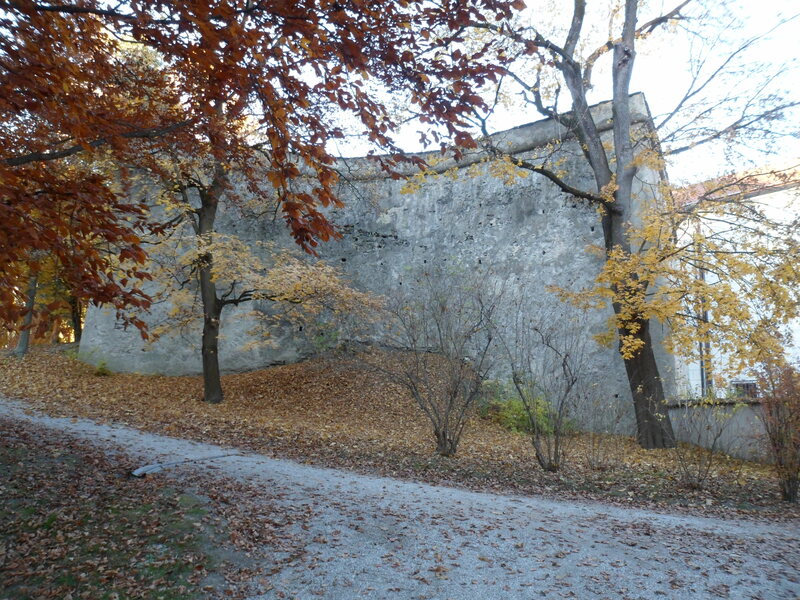 Further along on the southern approach to the Schloss, there is a narrow gap between this stone-walled structure and the path up to the upper castle. Someone approaching would come up through the green grass and few, large trees of the park. Just before the gap, at the very end of this large earthen structure, there is a temporary wooden staircase. Nobody is around, so lets climb it and look along the south face of this structure. Looking east along the bastion of Schloss Ambras. Photo by Sean Manning, November 2015. The space immediately in front of it has been turned into sheds and a gravel parking lot masked by a modern hedge, almost as if it were once a ditch or canal or other low, swampy space. Looking south from the bastion of Schloss Ambras, Innsbruck. Photo by Sean Manning, November 2015. The large earthen structure is topped by a stone wall about four feet tall and a foot or two thick, as well as by a house where the caretakers live. Today it serves as their yard. If I crouch a bit I sure have a wonderful view over the gravel road which leads to the the ramp up to the upper castle and the gap between the large earthen structure and the ramp! When I look across the gap towards the upper castle, a tower looms over me. This is the one outlying tower which stands away from the bulk of the main castle and overlooks the ramp and the large earthen structure. It is a fine, scenic piece of architecture. Looking west from the bastion of Schloss Ambras, Innsbruck. Photo by author, November 2015. Lets go back down to the park, walk forward along that broad gravel path through the gap towards the lower court, and then turn around. The large earthen structure is on our left, and the ramp to the upper castle is on our right. 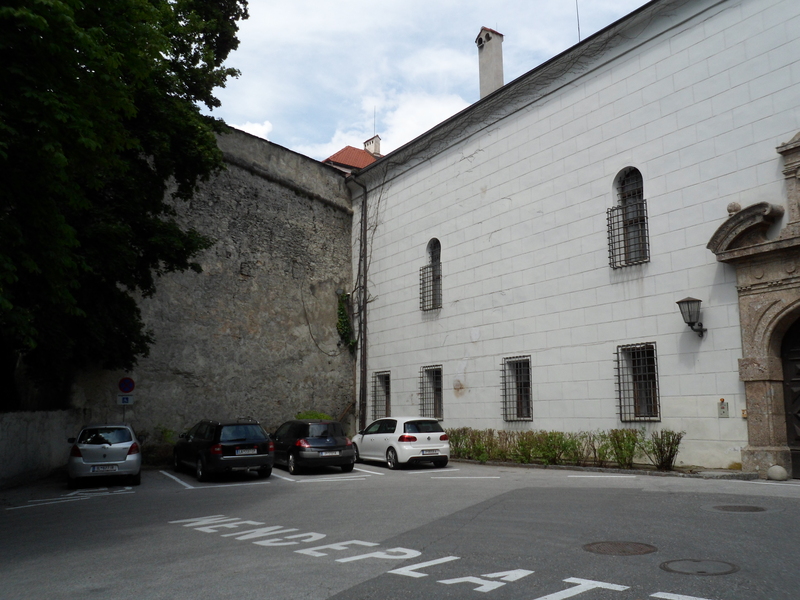 This area was heavily renovated in the nineteenth century, to make access to the upper castle easier and imitate fashionable English architecture with ivy-clad stone, and it may have been less accessible originally. 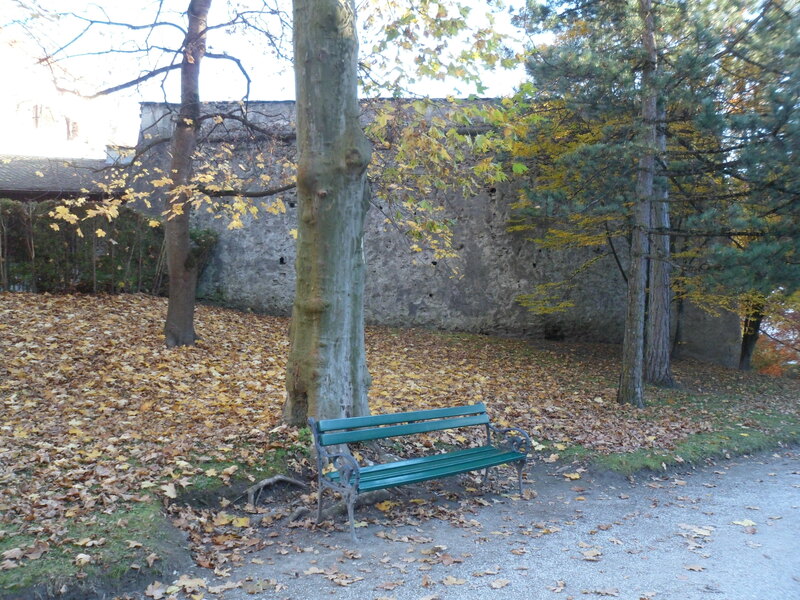 Looking from the lower court towards the park through the gap between the bastion and the ramp up to the upper castle. Photo by Sean Manning, April 2016. Next week I will continue this stroll, scrounge up some maps, and talk about what I think the designers had in mind when they renovated the Schloss for Philippine Welser in the sixteenth century.